I love sequins, I love pleather, I love vampy, skin-tight ensembles that scream for the accompaniment of a dark bar, a handsome stranger and a dirty martini. But despite that, I also have a soft-spot for rich wools, cozy blankets and cultured textiles. That's why, my Christmas list this year will definitely include items from The Portland Collection by Pendleton Woolen Mills. Alright, if you saw my post last week you may recognize the connection- yes, I'm a wee bit impartial to companies that have ties to my beloved city & home. Pendleton Woolen Mills is based in a city by the same name directly 3-hours due East of Portland. You mayyyy have heard of the town before due to the weighty fact that it's where Kevin Federline hails from - a fun trivia fact for all ages. I have always had a fondness for Pendleton after growing up with a couple of their magnificent blankets: the weaving was phenomenal, the print was spirited and the blankets were just about as warm as they could get. Since that point, I've lusted after Pendleton garb and its Native American flair. When I found out that three Portland designers were creating The Portland Collection- I found myself tickled with joy. 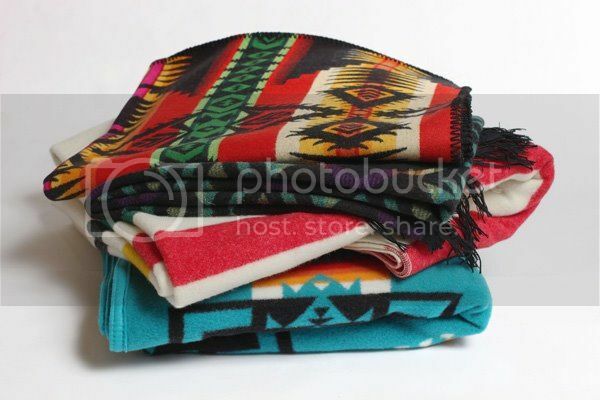 I want to rock Pendleton scarves on a chilly Sunday morning while I thrift shop in the bohemian niches on the East Side. I want to spend an entire weekend swilling coffee at a cabin draped in Pendleton ponchos. And I want to venture off to the beach for the weekend with a Pendleton wool hat cresting atop my head. Trendy and elegant evening wear it is not. But for a casual, earthy, luxurious, sportswear look- Pendleton is hard to beat in quality. Think of it like a refined Abercrombie & Fitch without the tacky branding and obnoxious ad campaigns/clientele. For many more trendier and affordable looks, check out Pendleton for Urban Outfitters HERE. So... what do you think of Pendleton style? Yay or Nay? *I wasn't compensated at all for this post, just pitching out of sheer love. my sister is a pendleton fiend. this reminds me of her. I love that little bag! hmmm don't think its really my thing. the blankies i would go for fo sho, but the clothes i'll give a miss. I love learning about local brands! Thanks for sharing your Portland love. It does have an Abercrombie feel to it. I'm not sure why, but it does! Thanks ... Now I need EVERYTHING that you just posted here. Mr. A is going to hate you. I'm adding, like, 10 new things to my Christmas list. not a huge fan of so much pattern but I'm kinda liking it... especially that t-back dress! I would so rock that with some black tights and boots! I love the patterns and prints! So cool! Thanks for your note, Caitlin. So appreciated! Hope you're having a good Monday. definitely agree that this place is fantastic! my sister in law has the cutest poncho from here! adore! YAY! I love this!! Especially how it's so navajo indian inspired .. gorgeous indeed!! Lucky you to have these guys from your home to brag about. yay! i like it alot and think it would look sooooo good on you!! i LOVE the hat! looks so comfy!! nay for me, but of course, that is a personal preference. i like some tribal prints and other printed fabrics, but i'm not sure the thick wool and big sack looking things are for me. if i was tall, that might work. i'm not so it makes me look like someone put me in a bag! LOL never got into the target missoni stuff either, which are sorta like this, i could be wrong. it's cute...but not really my style. i do enjoy that racerback dress though. pretty pretty snazzy! Good for you in promoting some of your local companies. 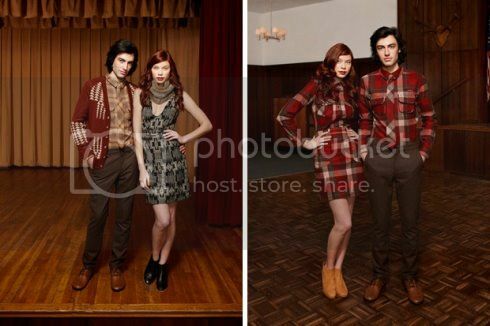 We have an old woolen mills not to far from us and they have some fantastic clothing. Loving pretty much everything, espically that blouse with the tribalish print, paired with the camel leather(?) skirt.